Portrait of an Israeli Humanist, Meir Goyichrach Despite war and terrorism, Israelis are thriving. Several months ago I wrote an article on Parenting During War to provide guidance to parents on supporting their children emotionally during times of conflict. Let me extend my heartfelt thanks to our readers who sent kind emails and shared the article with their friends. I was most gratified to see the article translated and published in Hebrew in Israel. I hope that my words provided some comfort. I want to take this opportunity to share a particularly moving letter that I received. One important aspect of dealing with any adversity in your life or that of your child is to paint an accurate picture of the event. Whether you are experiencing the trauma of war or trauma in your everyday life from a motor vehicle crash, your healthy response requires a balanced, accurate narrative - not overly optimistic, not overly pessimistic. Unfortunately, the image of Israel that our children and we receive from the media is overwhelmingly negative. A country in conflict, under siege, is not the Israel of Israelis. Despite the adversity that Israel experiences, Israelis thrive in their everyday lives and loves, the sciences, the arts, and business. Even during the recent war, Israelis remained optimistic and humanistic. We have much to learn from the resilience that they display. "War and violence have been an ever-present experience in Jewish history. In the face of these horrific events, Jewish families have continued to thrive. This resilience and a survivor's mentality have been key features of the Jewish identity." The main character in the story below, Professor Meir Goyichrach, embodies these characteristics of the Israeli with modesty and humanity. I wanted to share his story with you (at his protest) to convey the compassionate and human side of Israel that is not often seen in the news. Professor Goyichrach is a well-known figure in wide circles of the local Israeli experience. The association that he forms with people is direct, leading to his preferred simple, friendly moniker - Meir. I have been fortunate to know Meir for 18 years and, during the recent war, performed with him as part of the Kramim Choir in musical evenings and volunteered along side him in clinics set up for Israelis displaced from the North. Recently, Meir and I met for a meal in a restaurant in Rehovot, a few days after the ceasefire declaration in the conflict between Israel and the Hezbollah. He arrived for the meeting a few minutes late. Despite Meir's short, thin stature, he came in radiating the vitality of youth --- energetic and standing tall. He sat down across from me, organizing his thoughts and preparing to tell me what his contribution was in the "Rearguard of the Front" during the war. I knew that he had spent days and nights in the northern settlements, organizing assistance for the inhabitants, and I had asked him to recount his experiences. Meir, Professor of Behavioral Sciences, aged 65, retired two years ago from his post at the University of Tel Aviv where he served as a lecturer. In his retirement, Meir serves as a strategic adviser to the Women's International Zionist Organization . In this position, he builds on his previous work and personal connections to initiate a relief effort for inhabitants of the North during the war with Hezbollah, enlisting support from anybody that he possibly could: his academic friends, students of the behavioral sciences, teachers and friends. When I asked him about his arrival in the North, he appeared to be reliving those early days of the conflict in "Kiryat Shmona" as he described what he found. "The reality was terrible. Whoever could, vacated the town. There remained a sad group of lost people. After 10 days of fighting, the euphoria of the early Tzahal victories was short-lived as the situation deteriorated. The public felt abandoned by the government, and demonstrations began. Because the government had not declared a state of emergency, the community services, national and municipal, were insufficient. On the other hand, the private sector came to their aid - private sources, welfare societies and benevolent people. As a result, there were two types of shelters --- public ones that received support from the local authorities to which aid was extended and private, voluntary forces. Herein was revealed the beautiful face of Israel. Artists and musicians arrived and organized public singing. Representatives of factories provided clothing and equipment, and there was a strong feeling of loving-kindness. "Unfortunately, however, there were also needy people who were physically incapable of reaching the public shelters and stayed at home, some of whom did not have access to bomb shelters. These people were the infirmed, the elderly, and new immigrants. They were desperate. We reached out to them. The students were on the frontlines, helping these people in need, providing not only tangible support but also moral support. They held talks, organized sing-a-longs and instructed them in painting to pass the time. They brought food to them from the public shelters. The residents of the shelters saw the students as their salvation. They felt less abandoned knowing that youngsters came to them from the center of the country, and this softened some of the frustration. The heat in the shelters and in the security rooms was unbearable, made even worse by the associated dampness and strong odors." I wanted to know what Meir felt when he encountered the reality. "I myself was not capable of remaining for too long with the people who were suffering. From time to time, I was needed outside to contend with the anxiety and trauma experienced by the volunteers and to support the organizers." Suffering anxiety and unbearable reality were not foreign to Meir, a survivor of the Holocaust. He left the Inferno at the age of six. Another aspect of Meir's volunteer activity during the war involved organizing WIZO-sponsored institutions in the center of the country to absorb residents from the North. About 750 families from the North were absorbed in these institutions and remained there until after the ceasefire. The services provided were compressive: accommodations, food, healthcare, laundry services and entertainment for the adults and children --- all without any payment. Everything was mobilized with the help of finances from WIZO and from federations abroad. The international response was fast and the spirited volunteering of all the staff of the WIZO institutions was accomplished without restriction. It was amazing to see the Boarding School staff and the pupils who gave up their summer holiday to provide companionship and entertainment. In addition, helpers arrived who were not connected to WIZO. Nurses, who were on summer vacation, did duty in the clinic; pensioners worked in the kitchens and laundry. There were many donations from private people, companies and businesses." (This was also reported in the press. R.M). Based on his experiences during this war, Meir concluded that, despite the failure of the military and political leadership, Israel as a nation is strong even in times of distress. The people of the nation show strength and come together to support each other when put to the test. This war, however, displayed the reality of two populations in Israel --- one was the population of welfare that waited for help to be given to them and the second was the population of kibbutzim and collective agricultural settlement that decided to stay in their homes but derived support and strength from within themselves. According to Meir, the first group is decidedly the result of ongoing failure in the educational and welfare policy in Israel. The policy of the Israeli government from its inception was to provide education to all strata of the population. "Today," says Meir, "there has grown up a third generation that requires relief and a welfare population that lives from grants and is lost. The State that gave them "fish and not fishing rods" is responsible for this." Meir is grieved by the results of the educational system, but he is not disheartened. It has increased the need for his untiring action in voluntary work and in any possible way, either on national level in fulfilling a string of tasks in the Department of Education and Welfare or on local, municipal level at schools. Professor Goyichrach's lifelong involvement as an educator in Israel began in his youth when he volunteered as a guide to groups of youth who roamed the streets during a time when he himself struggled in the educational system. He bounced between schools and Boarding Schools in the country as a young immigrant. The biography of Professor Meir Goyichrach could serve as good material for a film or exciting book. It is a story of the small boy, a Holocaust survivor, who has since made a long, winding, restless journey but remained a "child." Meir was born in Russia (then Poland) in 1941 to intellectual parents. His mother was an actress and his father, an engineer. Meir described his early education from special parents as warm, but his formal education as Spartan, an education demanding success and inner understanding whereby only you can determine your fate. In 1946, when he was six years old, Meir was liberated from "Hell," malnourished and underweight. He was transferred together with his parents to a camp of displaced persons in Salzburg in Austria and then was sent for six months of holistic rehabilitation in Switzerland. His uncle, who was a musician, identified in the child a flare for music and urged him to study in the conservatory in Mutsertaum in Salzburg. He studied the violin for three years without knowing the local language. At the age of nine, he came to Israel with his parents and skipped straight into Grade 4. The lack of early formal education and knowledge of Hebrew combined with the trauma of the Holocaust were deeply etched in the child and did not allow him to have a normal childhood and adolescence. Until army age, he did not study in an organized way, and his teachers complained that "the child is capable and even a genius but not in the right place." At best, they forecast a Bohemian life for him or a songwriter or a frustrated musician. Meir spent these years with a feeling that he was lost, displaced and wasted. "I had a feeling of failure when I saw my friends choosing a suitable path and marching towards it, to a structured way and reaching a goal." He traveled abroad to find his way. He wandered with a knapsack and guided tours for his living. After a number of years of wandering, he returned to Israel and when he saw what his friends had accomplished and what a huge abyss was opened between his life and theirs, he was afraid that he would fall into it. The feeling of deep distress turned into an inner outcry. Yet, again, a survivor, he chose to leap to the other side of the bank of the abyss to the side of life. The decision was made. At the age of 34, he matriculated in the university. Immediately afterwards, he continued with graduate studies, and at the age of 44 he received his doctorate in Behavioral Sciences. In the new path of life that he chose, he saw that he had a lot to offer. He indeed proposed, gave, devoted, contributed and created. The environment restored to him both feelings of love and appreciation. He has touched many lives. He is reminded of his good work by the many people he meets from his past who tell him what he gave to them, what changed in them and how he has influenced them. I asked him what motivates him. "The Holocaust," he said, "accompanies him all his life." "The genetic memory" --- that of nothing being certain --- paves the way for him to survive and motivates him. Another drive, just as strong, is the importance of the State, which is at the top of his considerations. People of his type and with a similar background perceive every threat as a total one. They enter a defensive position and accumulate strength in order to withstand every obstacle. The result is an unrelenting creativity. Even at his advanced age, a small boy shines through who wants to break down walls. He has a strong need to be the best at everything thanks to his parents' demanding education, but in every endeavor, Meir brings his unique creativity. In the educational, therapeutic and social fields, he conducted research and implemented novel educational initiatives, therapeutic systems and rehabilitation of neighborhoods. He works to bring together sources of need with those who can fulfill the need. He creates compatibilities and unique combinations. Standardization and routine are vulgar words to him. After retiring from the academic work two years ago, Meir developed a new and exciting venture in the field of educational business entrepreneurship. These days, he is a partner in a number of projects, ranging in scope from education to economics. Here the ability has been shown to combine "axes" of broad scholarship, creative and manifold vision and ability to communicate with a wide variety of people and "to adapt them" to implement varied projects. With all due respect, I asked Meir how it is possible to attend to the details necessary for success in one project with his involvement in so many projects. He explains: "My role in this matter is to create an idea, to launch it, to mobilize madmen to the task and to run forward and you'd be surprised that I have many buyers for my ideas. It also happens that I don't succeed." Meir never rests on his laurels, even for a moment. He continues pushing forward hungry for more motivation. Over the past fifteen years, he has reconnected with the musical talent of his youth: it appears that his holding capacity for music burst like a fountain thanks to the love of his wife that liberated it. At age 50, the second part of his personal life, his musical life, began thanks to the love and support of his second wife. They started their married life with no worldly positions, having given all of their properties to their first spouses. But their love was so great, it carried them through any hardships. His wife recognized that Meir had suppressed his artistic expression after abandoning music as a young man. Throughout his academic working years and his other engagements, there were artistic outbursts of creativity in writing, music and jewelry making. If you look at each one of these creations, the level of talent and originality was evident, but the arts were not a large part of his life. "A wonderful thing happened to me," Meir exults like a young boy in love. "My wife extracted from me qualities and energies in the field of music which I no longer thought I could experience. There were things that sank and turned into painful memories. She was confident that I could overcome this. She brought me to the level of motivation and substantiation which I didn't know about." His close friends tell, and he agrees, that fate rarely succeeds in combining two souls in such a way. He has received recognition among his friends for his talent with the banjo and mouth organ, with which he is always armed. His success with the saxophone, however, is inspiring. "Until 5 years ago, the saxophone was a painful memory for me of abandoning music from life's compulsions." His avoidance of the saxophone represented his partial separation from his past experiences, like a feeling of mourning after a loss, and he did not dare touch the painful subject. His wife acquired a saxophone as a surprise, restoring a part of his past. When he saw the saxophone, his reaction was total shock, and his first reaction was the hardest for the reason that she dared to touch on the places that were so painful. Today he has no words to describe the nobleness of soul and uncompromising love that his wife demonstrated to him by this deed. As proof, the virtuosity that Meir demonstrates on the saxophone amazes experienced musicians. But it is more than simply playing the instrument, it is as if he is making love to the instrument. His friends "complain" with sarcasm about his hunger for playing and that he overshadows everyone in his surroundings until they give up and yield the stage to him. Kramim Choir in Rishon Le Zion. Despite his many business and volunteer obligations, he remains true to his creative expression. 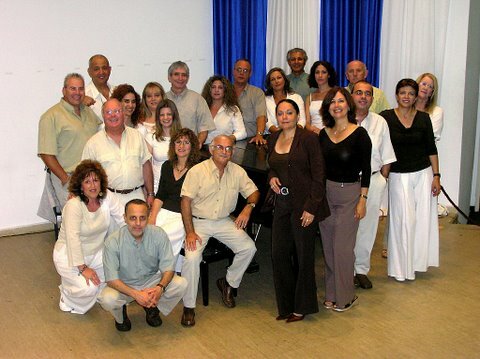 Twenty years ago, Meir and several friends founded the Kramim Choir in the Rishon Le Zion. He is one of the few founders who remain in the choir but it continues to thrive thanks, in part to his commitment (especially his commitment to appear at all the rehearsals). A lecture in the far north or a holiday in Eilat has not stopped him. He inspires the group to strive for excellence, not tolerating lateness or absences, even from himself, but there is a strong personal connection. His friends feel free to involve him in their personal matters, sensitive as they may be. Married couples among his friends have turned to him more than once. Moreover, they will relate the times he took the initiative and intervened when he noticed feelings of depression in a member of the choir. In the years after his retirement, Meir tells that he invests his whole being in music in every possible direction, in business too. More than anything, it seems that music vibrates in all the limbs of his body. He will not refuse any invitation to appear at events or ceremonies in a voluntary capacity. People who were present at one of the memorial ceremonies that were held at "Yad Lebanim" (Memorial Hall for IDF soldiers in Rishon Le Zion) relate how he vibrated the hall and their hearts with awesome reverence when he played the Requiem of Viotti on his mouth organ. 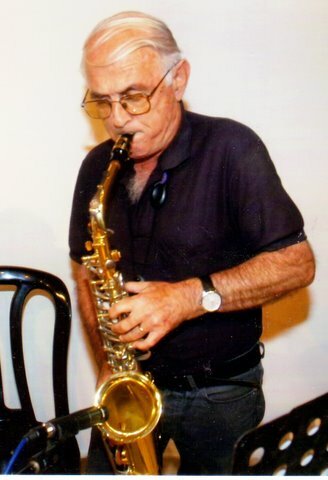 At another event, he played "Mine Yiddishe Mama" on the saxophone and afterwards Rabbi Lau, the chief Rabbi of Israel, who himself was a Holocaust survivor, expressed his emotion at the tune. Today, the small boy of 65 years of age is continuing to create, to give and search for more challenges. And he never forgets from whence he came. His hand is still outstretched.